As FIFA’s upcoming Congress draws closer ahead of this summer’s World Cup, the relationship between Israel and Palestine has only gotten worse. Palestinian Football Association Chairman Jibril Rajoub says Palestine will be moving forward with their plans to seek sanctions against Israel when the Congress meets in San Paulo on June 9-10. Speaking at the Soccerex Asian Forum on the Dead Sea on Tuesday, Rajoub said Palestine had made efforts; “we tried to change” but that Israel had not been cooperating with a Task Force established last year by FIFA president Sepp Blatter. Rajoub explained, “They cannot keep behaving like the neighbourhood bully, violating all the statutes of FIFA and the Olympic charter and rejecting any good intention either from UEFA, FIFA, the AFC, Palestinian FA or any other interested third party”. “There have been two disastrous events. Last week our national team was in Qatar in camp preparing for the Asian Cup and when they came back the Israelis arrested one of the players and now he is in jail with no reason,” he said. “I am sure they will release him in a week or two so why arrest him in the first place? “The other event was the famous story that they shot and injured two athletes who had to go to Jordan for treatment for three months. Then they came back and arrested them,” Rajoub added. “I don’t think that such a policy should pass without sanctions, without being punished. But the final straw came when Israel sent a letter stating they were “ready to develop sport in Palestine”, but only under their purview! Rajoub is also upset the Israelis recently sent a letter to Blatter which said: “We are ready to develop sport in Palestine but this should be done through our channels”. It was the final straw for Rajoub who told Reuters: “That implies we were affiliated to Israel. “It means they are not recognising the very existence of Palestinian sporting entity. This is the substance of the problem and for us I don’t think anything will happen. It’s about time. Yes, it’s apartheid. How odd that Palestinian FA should seek sanctions BEFORE PA goes to ICC. But one small step at a time, I guess. And maybe “sport” sanctions TODAY will catch Israeli attention in a different and more profound way than ICC condemnations of politicians DAY AFTER TOMORROW. You may not be aware that Abbas has chosen not to apply to join the International Criminal Court. Abbas cannot go to icc due to the suicide bombing campaign against israeli citizens in 2001 onwards.the slaughter of innocent civilians both israeli,arab and foreign tourists will always be a stain on the plo.not saying that israel is any less guilty of war crimes,imho. hmm, is this your hunch or are you just speculating? Abbas cannot go to icc due to the suicide bombing campaign against israeli citizens in 2001 onwards. For good reason. If he joins, he will expose his government to liability for every rocket out of Gaza, every subsidy paid to families of suicide bombers, and every theft of donor funds, to think of only three. Not to spoil your fantasy, but making welfare payments to families of criminals is not an ICC offense. In any event, Abbas already accepted the jurisdiction of the ICC for any crimes he committed, back in 2009. So please explain why you think he won’t do it again? Needless to say, the flood of Israeli lawsuits never happened back then and they are pretty much a hasbara no show nowadays too, because there is no such thing. In order for the government of Israel to make a referral, it would have to accept ICC jurisdiction for any crimes committed on territory that’s subject to its jurisdiction or committed elsewhere by its own nationals, just like Abbas did. I don’t think Livni would advise them to do that, since there is no immunity or legal challenge available under the law in Great Britain against an ICC arrest warrant. He doesn’t have too. The parties to the Rome Statute granted third party states the right to accept the jurisdiction of the Court on an Ad Hoc basis under Article 12(3) and did not grant the Prosecutor statutory authority to decline or reject written declarations on their behalf or without obtaining their consent, in accordance with the rules contained in the Vienna Convention on the Law of Treaties. As I recall, South Africa at the time practiced apartheid in the realm of sports . Whites and blacks could not compete , or play on the same teams, which was a compelling argument for banning SA from international events. That’s not the situation in Israel. I think the fact that the usual hasbara brigade can respond to a story like this defending Israel rather than having any kind of condemnation for the treatment of Palestinian athletes (and Palestinians in general) by Israel shows that their credibility, moral, intellectual or otherwise. is zero. I think the fact that the usual hasbara brigade can respond to a story like this defending Israel . . . Hostage, it will be ended, but has not been ended yet. It still has to go through a ratification process and no time frame for this is given. Also, based on the information to date, it is to be replaced by a system of five year contracts between employees and employers. But the details of this are still being worked out. In spite of an increased number of “inspectors,” enforcement of laws is hardly existent. Foreigners in Middle Eastern Countries, including Israel, remain vulnerable to abuses. But things are getting slowly better. Ellen I was merely pointing out that it’s our turn to engage in whataboutery. Qatar went through the motions and responded to criticism directed toward its situation, while Israel has not made a similar proposal to ease the travel restrictions and eliminate abuse and discrimination it directs towards Palestinian athletes. The key reform in Qatar will allow workers to leave the country, within 72 hours, without the need to obtain their employer’s consent. Many complained that they were being worked without pay, in return for their room and board, and that they couldn’t leave to find work elsewhere to support their families without obtaining permission from the companies that were exploiting their condition of servitude. While I agree with you on the whataboutery, that is simply not true. The government has made a vague proposal about ending the sponsorship system, pending ‘approval by the parliament’. In other words, they are probably hoping that they can string this out for a while, and when international attention shifts elsewhere – which it will – give up the whole thing. Having lived in two Gulf countries, including Qatar, I highly doubt that there will be any significant change to the sponsorship system, as that is the basis of employment law not only in Qatar, but in most if not all of the Gulf states. This sounds to me like just another PR tactic concocted by one of the expensive London law or PR firms the Qataris hire to spin things on their behalf. I of course hope that it leads to genuine reforms, but knowing the Gulf states as I do, I highly doubt it will. The Qatari reforms, which need to be submitted to the emirate’s consultative council and chamber of commerce and industry before being adopted, will also end the longstanding requirement that foreign workers obtain their employer’s consent before leaving the Gulf country. “The current exit permit system, which requires the employer’s consent for an employee to leave the country, will now be replaced with an automated system through the Ministry of Interior,” the statement said. The new system will automatically grant an exit permit to an employee “after a 72-hour grace period prior to departure,” it said. I highly doubt that there will be any significant change to the sponsorship system, as that is the basis of employment law not only in Qatar, but in most if not all of the Gulf states. Yes, the article notes that Bahrain abolished the system in 2009, but Kuwait dropped reported plans to follow suit in 2011.
jon s: As I recall, South Africa at the time practiced apartheid in the realm of sports . […] That’s not the situation in Israel. 1. So you are saying: no apartheid by Israel in sports. Then, outside sports, they do? Thank you for confirming. 2. Read the post. Q: Why cannot a Palestinian football team play a friendly against Israel? A: Because Israel prohibits it for being non-Jewish. Without question, the average Man On The Street in any country in the world except the US and Canada will have more interest in the Israel – Palestine – FIFA issue than in any number of TV spots, articles and op-eds about the Israeli mistreatment of Palestinians. The worldwide media will cover the dispute and hopefully in doing so, will bring to light the general brutal Israeli treatment of the Palestinians in addition to those specific to soccer — although the story regarding the two Palestinian players maliciously having been shot in the legs will generate the most coverage. If you want to ban all the countries with poor human- rights records – by all means, good luck with that. On the other hand, athletes from Iran and from some other countries consistently refuse to compete with Israelis, in defiance of international rules and norms. They are the ones who should be banned. The ADL reported today that 26% of the world’s population is anti-semitic. This is a striking result. I personally do not think that this is hatred or even dislike for all Jews; I think that it is based on an intense loathing for Israel because of the despicable and undemocratic strategies they have used to steal the Palestinian’s land and resources. There is a serious level of hostility against Jews because of this as discovered by the ADL, so I think that Israel should work fast to address the problem. This is a striking result. therefor it’s not anti semitism. Israel should work fast to address the problem. I’m astonished. I thought it was supposed to be 100% of us. (c) care enough to have an opinion. The ADL’s report noted that the most anti-Semitism comes from the Palestinian people in Gaza and the West Bank. Sure takes a lot of chutzpah to characterize resentment by those (also Semitic) imprisoned and discriminated-against people as anti-Semitic. Expelling Israel out of FIFA will be tougher than the sporting boycott against Apartheid-SA, simply because Israel has a lot more lobbyists and billionaire backers. But we’ll get there. According to one of the communal New Zealand leaders, Zionism is now a dirty word in the country and the Jewish community has skipped any mentions of Zionism in their organizations. Note, too, that the same kind of brazen behaviour from the Israelis(stealing passports from New Zealand nationals) was sharply rebuked and Helen Clark’s left-wing government at the time essentially frozed relations with Israel. That’s the benefits you get by not having a significant Zionist lobby. Take heed, America, UK and Australia, take heed. 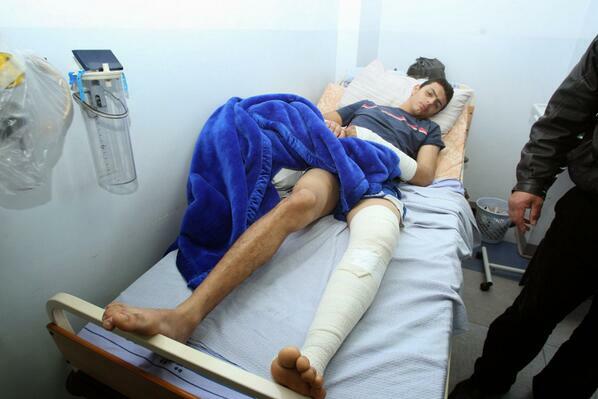 Being on the Palestinian national football team doesn’t grant you immunity from the consequences of your own actions. The truth about the “unconscionable attack” on Jawhar Nasser Jawhar, and Adam Abd al-Raouf Halabiya has now come to light (while Mondoweiss’ story about it has yet to be corrected), and in time the whole story about Moraebe will be as well. The only question then is if Annie will cover it. no i will definitely not be covering that islamofascist elder of zion twist on the story. just because the boys were standing months later doesn’t mean it never happened. As you can clearly see, he hadn’t been shot even once in the foot, let alone eleven times. If he had actually been shot eleven times in the foot, he wouldn’t have a foot. Rajoub claims they were treated in Jordan. Does Jordan have Hebrew writing on the sheets? Who are you going to believe, him or your own lying eyes? Rajoub claims they were treated in Jordan…Who are you going to believe, him or your own lying eyes? anyone following the story knows they were first treated at the hospital in jerusalem (Hadasa) and then transferred to a hospital in jordan. so show me evidence the second photograph was released “the next day” after the attack. So if you’ve read the Palestinian sports blog, you know the pictures of Jawhar are legit. Unless it is hasbara too? Unless you’re going to claim that that isn’t him? Let’s not get bogged down in the details, Annie. The point is: you said that Jawhar had been shot eleven times in the feet. Everyone with eyes can see that isn’t true. So are you going to issue a correction in your article? 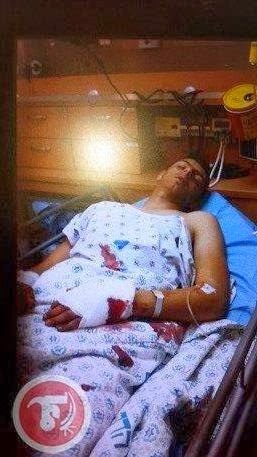 >> Being on the Palestinian national football team doesn’t grant you immunity from the consequences of your own actions. I agree. And being a Jew – or a “Jewish State” – shouldn’t grant you immunity from the consequences of your own actions. The time is long overdue for Zio-supremacists to be held accountable for their past and ON-GOING (war) crimes. Uh, Sperling is da newz–minus his rabid Jewish racism in US media. I think Sperling is an excellent stand-in for the US government’s view of the Middle East. You? FIFA 1973. In the qualification rounds for the 1974 World Cup (the final tournament in West Germany), two countries were to play for one spot: Chili vs. Soviet Union. First match in Moskow, 26 September: 0-0. Return match: planned 21 November 1973 in Santiago de Chile, Estadio Nacional. That is, ten weeks after the coup by Pinochet (9/11 1973). The National Stadium in Santiago was used as a concentration camp for political prisoners. Before the match, is was emptied. Soviet Union asked to play in a neutral location. FIFA refused, Soviet Union decided not to fly. Chili “won” the match, and so went to play the final tournament in Germany. FIFA, in certain ways you can depend on them. FIFA is massively corrupt. If they cared about human rights or anything at all beyond sacks of $$ around football (soccer) they never would have given Qatar the World Cup nor pretend that the State of Qatar is modernizing employment conditions and freedom of movement. Am afraid it will more than this letter to the crooks at FIFA. As corrupt as FIFA is, it may be better than ICC. @Ellen- I agree on the corruption, but have to disagree on the similarity with what Israel is doing. As bad as Qatar is, and it’s bad, it’s outside of FIFA’s domain. In a non-corrupt world, FIFA would not award the championship to Qatar because of widespread social “problems” in that country. But what Israel is doing targets FIFA and the game itself. FIFA can’t (well it can, of course) ignore that without invalidating its own reason for existence. In addition to all the Qatari-like “problems” that Israel imposes on the Palestinians, it ups the ante by directly (and violently, ffs) targeting international players, coaches, associations, and venues. That’s a direct assault on the international game. It’s tough to see how that can be overlooked. Expanding out a bit, this article shows one minor example of the confusion and challenges in the whole 1S-2S discussion. The PFA director doesn’t want Israel running the show, but that’s only relevant in a 2S outcome. In a 1S outcome, toward which the Israeli insistence on directing/assimilating PFA affairs is just/yet another step, the odds and abilities of Palestinian players getting through a heavily-rigged Israeli football association and onto the 1S national team are vanishingly slim. At the risk of being repetitive (yet again…I know I’m a minority on this), these kinds of national representation/pride issues are what a Palestinian State in Gaza could or would untangle. It could take them off the list of pressing civil rights and daily life issues that an Israel-WB 1S will be devoting its full energy toward solving, and give Palestinians something to rally around in the process.